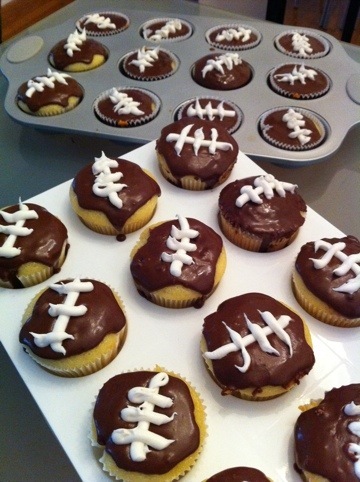 These might not be the prettiest football cupcakes one has ever seen but I am pretty proud of my efforts! We are going to a football party today and I decided to make vanilla cupcakes with homemade chocolate buttercream frosting and a marshmallow frosting for the laces. Initially I wanted to make “team” cupcakes by decorating them with the teams’ colors. Problem was, I wasn’t sure who was playing today and I could imagine myself showing up to a party with cupcakes decorated with teams that were not playing! This was a safe plan and I’m sure everyone won’t mind because who doesn’t like a cupcake!